I haven't really been cooking much, and when I have it's been less than exciting and definitely not blog-worthy material. Yesterday's dinner was an exception, for I made mojo chicken (pronounced mo-ho). I've never heard of it before, but I liked the sound of the ingredients. 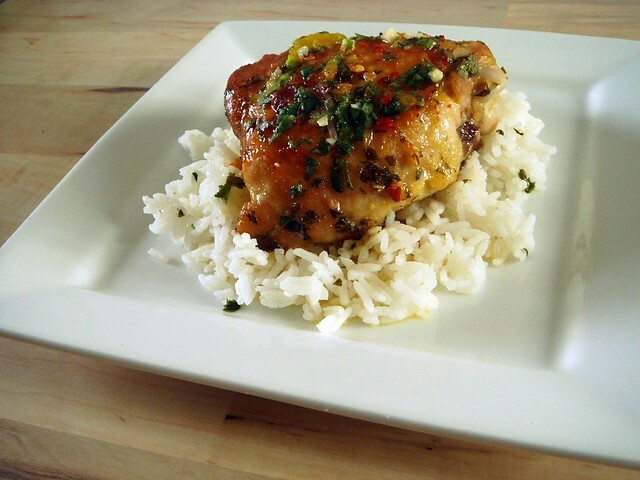 I'm always on the lookout for new marinades for chicken since it makes for a simple, healthy dinner. What is mojo? In Cuban cooking, it's any sauce made with garlic, olive oil, and citrus juice, according to Wikipedia. The recipe I'm using today didn't use any oil, but that's okay because I don't think it really needed it. The main components are orange juice (it took way too many oranges to get 1 1/2 cups - I filled it the rest of the way with water), cilantro, garlic, lime juice, and ginger. After it's whisked together, a portion is reserved for serving. 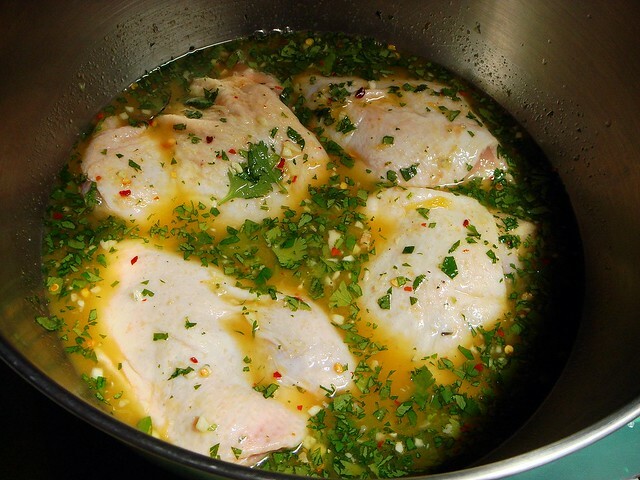 The citrus helps tenderize the chicken, so the longer it marinates the better. I just went for a couple of hours, though you can prepare this the night before and refrigerate it in a in a gallon size ziploc bag. I didn't follow the method of cooking the chicken specified in the original recipe, which was to first sear it in a skillet, followed by a brief stint in the oven. I just stuck it in the oven on 350 until the skin was nice and crispy and the meat registered 160. It took about 45 minutes. I poured a little bit of the marinade liquid in the roasting pan at first and added more throughout the cooking period. It doesn't end there. The recipe includes instructions for cilantro rice and quick savory black beans. I don't have canned black beans. All I have are dried beans and not enough foresight. But I always have rice, and rice takes just 20-25 minutes to cook. 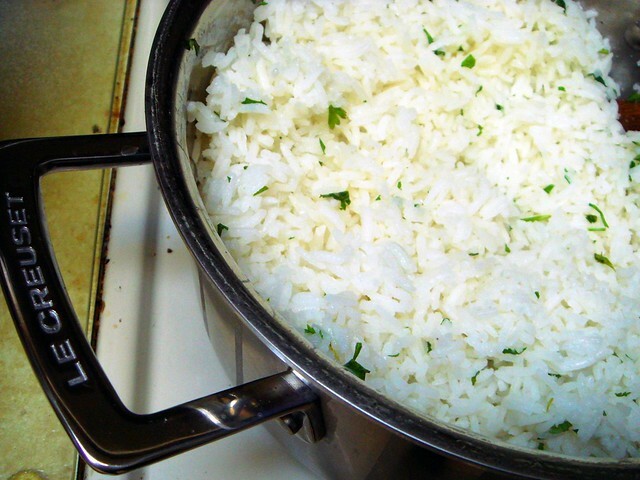 All you do is juice a lime into cooked rice and stir it in with chopped cilantro. I added a little salt, too. Cilantro rice is incredible stuff. I've been addicted to it ever since I ate a Chipotle burrito for the first time. I don't think this is an exact copy, but it tastes good and is easy to make. And that's what's for dinner. Mmm looks delicious! I bet it would the chicken would be great on the grill too! 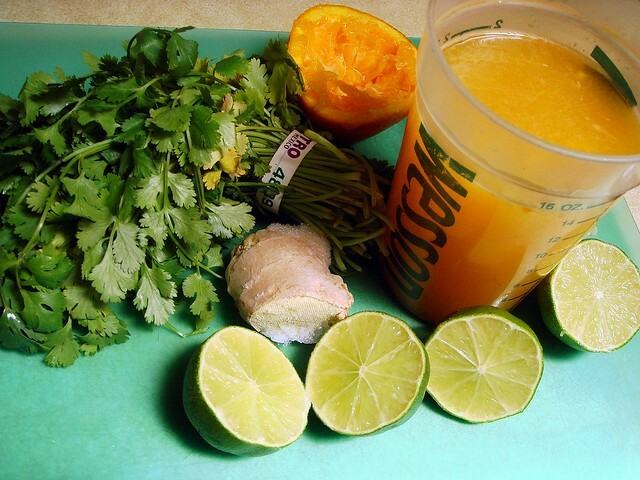 I love cilantro & citrus and this looks like something I would really, really enjoy! I am bookmarking this and adding it to my 'to make' list! Thanks for sharing :) Love the photographs too! never heard of this but it sounds so good!